The scale model of the iconic Man of Steel has gone back on display at the Advanced Manufacturing Park (AMP) in Rotherham, surrounded by a number of companies that are working to make the final version a reality. The sculpture was originally manufactured at the Composite Centre on the AMP and the charity behind the project, Yorkshire Icon Ltd, is now officially based there, inside the AMP Technology Centre. In 2012, planning permission was granted conditionally for the 27.3m high art installation based on work by local sculptor Steve Mehdi, on a former land fill site in Rotherham. The iconic piece of art has been designed to be a landmark gateway sculpture close to the M1 that "will recognise the history of steel and coal in the region, and preside over a new age of technology and specialised steel production." The Man of Steel is also set to play an important role in promoting education in science, technology, engineering and mathematics (STEM). The project has been assisted by expertise from AMP-based organisations, Performance Engineered Solutions (PES) Ltd and the University of Sheffield's Advanced Manufacturing Research Centre (AMRC). The two metre model is made from polyurethane resin board, a material normally used for creating prototypes and models of automotive and aerospace structures. This was sculpted at the AMRC Composite Centre on its CMS five-axis machining centre. Experts at PES are developing rapid prototyping to examine the potential of creating the monumental version of Man of Steel. Steve Mehdi, the sculptor behind the project, said: "It feels right that the sculpture has returned to its birthplace. Many of the innovative engineering developments for the Yorkshire Man of Steel project are led by companies based at the AMP Technology Centre and we're very proud to be associated with such a collaborative group of specialists and to be a working with a facility with an international reputation for excellence. "The legacy of this project fits perfectly with the AMRC's research and development success and I'm sure it will be a signpost to the advances in the new technologies and specialised manufacturing that is now a core part of the region." John Palframan, manager at the AMP Technology Centre, added: "We're delighted to see the Yorkshire Man of Steel return home. The sculpture always attracts attention and is a springboard for conversations between visitors and many of the people who work here." Last week saw the first cut of the Heart of Steel, two of which are set to be manufactured. 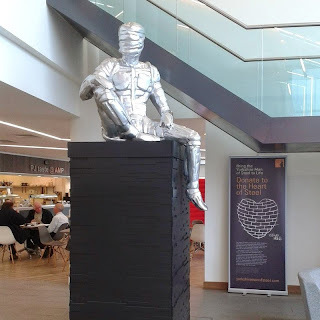 The Man of Steel is to have his own heart, a 2.5 tonne sculpture made from super alloys and containing up to 150,000 names of individuals from across the region. The other is set to be on show at the popular pocket park on Corporation Street, next to Rotherham Minster.